The butterfly orchid - Psychopsis papilio, is just one of eight species within the Psychopsis genus, although there can be a certain amount of confusion as a number of other orchid species outside of the Psychopsis genus which also go by the same common name. Native to central America, notably Panama, Trinidad, Colombia, Venezuela, Suriname, French Guiana and Brazil, its defining feature is its long lasting flower which from a distance resemble large, brightly colored butterflies. Like many other species of orchid, the butterfly orchid is an epiphyte (a plant which grows harmlessly upon another plant deriving its moisture and nutrients from the air, rain, and accumulated debris). What looks like a head is in fact a modified petal, as are the very long antennae-like structures. The outspread, dappled yellow and brown, wings are not true petals as one would think but sepals (modified leaves). 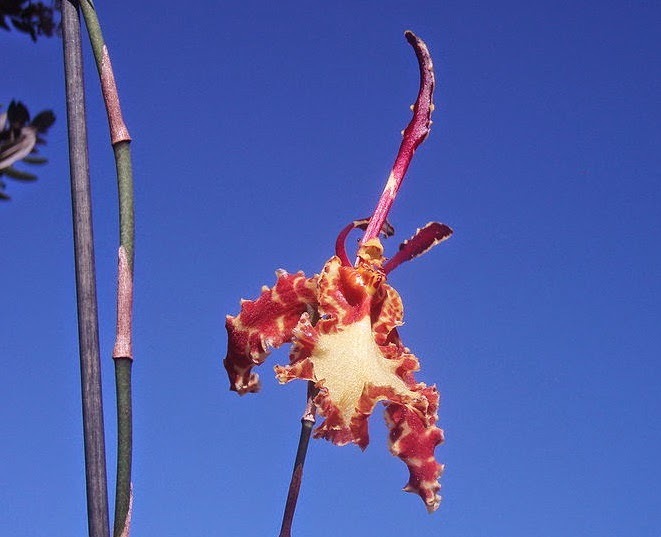 The striking blooms are approximately 13-15 cm long and emerge near the top of a the flowering stem, more correctly known as an inflorescence. Each stem will usually be between 60-150 cm long depending on how long it has been producing flowers. Only one flower will be in bloom at any one time on the same stem. but mature plants can produce more than one inflorescence. The inflorescence will continues to grow, forming new buds often over a period of several years. 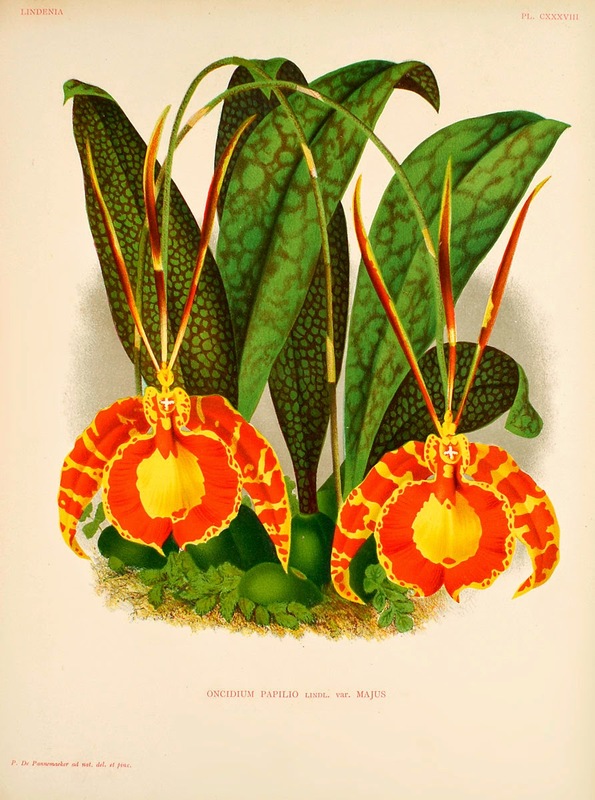 The erect, dull green leaves are approximately 15-25 cm long and each leaf is produced at the top of a single brown, mottled with red blotches, pseudobulb. Each pseudo-bulb will vary between 3-5 cm height. Its habitat is found in the lower montane forests where they prefer the shady, humid and wet conditions. Rainfall is moderate to heavy from late spring through early autumn. Plants can tolerate higher light levels without scorching but only when accompanied by high humidity and good ventilation. Cultivated plants should be watered often while actively growing, but will need the substrate to dry out between waterings. For example, the butterfly orchid should be watered every 2-3 days during the warmest period of the summer, however they may need several waterings a day in hot, dry weather. Be aware that cultivated specimens have a habit of succumbing to fungal infections if kept too wet over the winter.